Brody of course isn’t the movie’s only spirited detractor, but his argument resembles the most criticized element of Beasts. Comparing the movie to The Help is quite a stretch. That was such a whitewashed look at racism in the South that it completely drained the movie of its meaning and impact, no matter how great Viola Davis was in it. Zeitlin does not purport to speak for the black community in this movie, nor do he and co-writer Lucy Alibar give Hushpuppy (the exemplary Quvenzhané Wallis) a white agent by which to achieve her goals. As for sentimental? I would go so far as to say it rips away that value from Hushpuppy by the gritty, disturbing way it alters her worldview, by slowly killing off her father (Dwight Henry) after already taking away her mom. In fact, the entire movie is more of a childhood fable than it is a portrayal (or indictment) of rural black culture in Louisiana. Hushpuppy spends much of the movie retreating from the destruction that the storm poses to her quaint, self-sufficient (and mixed race) town on the other side of the New Orleans levee. She does this by conjuring up fantastical beasts called aurochs, which she initially hears about in a folktale from her schoolteacher. The portrayal of race needs to be addressed, though, because, even as the ardent early supporter of Beasts Amy Taubin remarked in her review in ArtForum, “color-blindness does not exist.” She goes on to say that whether or not Zeitlin’s portrayal falls within the bounds of artistic license is an important and very-difficult-to-answer question that must be asked of Zeitlin and his movie. For the most part I agree with her. Though Zeitlin is not black, I believe his portrayal of Hushpuppy and her father is warm-hearted and sincere. The world he creates here, one of both gritty devastation and magical realism, is deliberately contradictory. He does not romanticize poverty, as Brody wrote, but instead shows an American community that is, by and large, not part of America and really has no desire to be. When National Guard troops invade the Bathtub after the huge storm (which may or may not be Katrina) and force everyone to evacuate, the movie’s abrupt atmospheric change resonates deeply. The image of Hushpuppy in a dress with her hair tortured into a prim, tidy form while a daycare worker yells at her is one of the movie’s most devastating. Another is the scene where Hushpuppy escapes with a few other young girls and drifts to a floating brothel in the water, where she finds herself in the arms of a woman who may or may not be the mother she so desperately is looking for the rest of the movie. 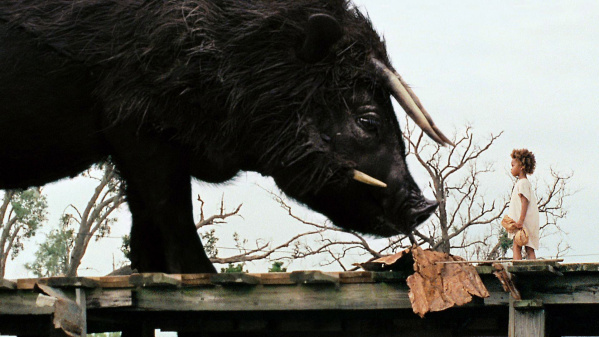 When Hushpuppy looks an auroch in the eyes, their mutual understanding of being a dying breed is perhaps the movie’s most crucial moment. It is not a celebration of the subculture Zeitlin and his low-budget crew so obviously fell in love with, but rather an illustration of how they are increasingly being snuffed out and tamed by a country that values them less and less. There is more than one disaster here, and even though they build off of each other, neither is victorious in the end. In that way it somewhat mirrors the modern film industry, increasingly polarized between low budget indies and big budget spectacle. That makes the resounding success of this movie even more cause for celebration. 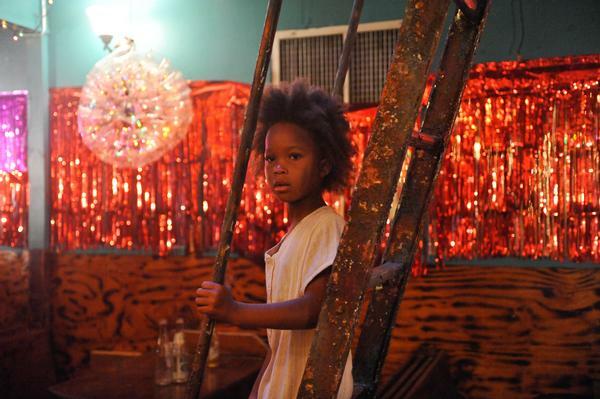 This entry was posted in Best Picture Nominee, Reviews and tagged Beasts of the Southern Wild, Benh Zeitlin, Best Actress nominee, Best Director nominee, Best films of 2012, Best movies of 2012, Best Picture Nominee, Cannes film festival, Dwight Henry, Lucy Alibar, Quvenzhane Wallis by matterspamer. Bookmark the permalink.